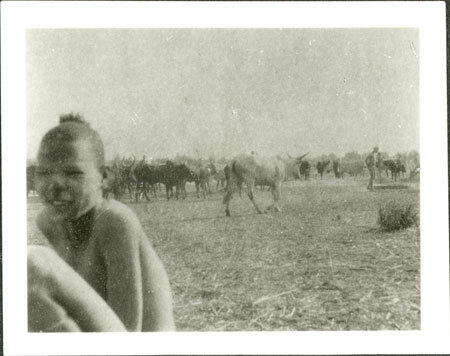 A youth sits in the foreground whilst cattle wander towards wells, one of which is just visible to the right with a man standing beside it with a stick. Such wells were dug in river beds in areas such as the Nyanding River occupied by Jimac and Gaaliek secondary sections of the Mor primary section of the Lou. This practice seems to have been restricted to the Lou and Eastern Jikany Nuer tribes, although less so after their territorial advance as far as the Sobat River and other rivers. It involved re-digging each season to provide a water source of about a foot in depth. Troughs for cattle were often placed around the holes, which belonged to a household.. Note on print reverse ms pencil - "4 195 "
Morton, Chris. "Nuer cattle" Southern Sudan Project (in development). 03 Jan. 2006. Pitt Rivers Museum. <http://southernsudan.prm.ox.ac.uk/details/1998.346.195.2/>.